The top Democrat in the US Congress has ordered a safety review for a Muslim congresswoman and her family after accusing President Donald Trump of putting her in danger by tweeting a video of her spliced with footage of the 9/11 attacks. 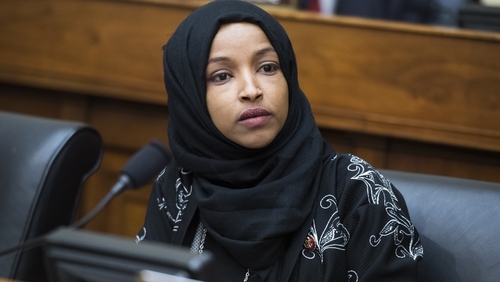 House Speaker Nancy Pelosi took time out from an official trip to issue a strong statement urging Mr Trump to remove the clip featuring Minnesota congresswoman Ilhan Omar. Mr Trump's spokeswoman Sarah Sanders has defended the president against accusations that he was inciting violence toward the Muslim congresswoman. Ms Omar has been at the centre of an escalating row after a clip emerged of her characterising the deadliest attack on US soil as "some people did something." On Friday, President Trump tweeted a video that juxtaposed the snippet, which Ms Omar's fellow Democrats say was taken out of context, with images of the hijacked planes used in the attacks crashing into the Twin Towers that once dominated New York's skyline. Menacing music accompanies Ms Omar's words. The clip, which had been viewed more than 9.4 million times, ends with the words: "SEPTEMBER 11 2001 WE REMEMBER." Democrats including Beto O'Rourke, Kamala Harris and Ms Omar's fellow first-time Congresswoman Alexandria Ocasio-Cortez were quick to rush to Ms Omar's defence, accusing the president and other Republicans of deliberately de-contextualising her remarks and endangering her life. Ms Sanders, however, defended Mr Trump, telling ABC's This Week that "the president is wishing no ill will and certainly not violence towards anyone." She added: "It's absolutely abhorrent the comments she continues to make and has made and (Democrats) look the other way. Ilhan Omar is the first African-born American, and one of the first two Muslim American women to serve in the US Congress. She mounted her own trenchant fight back, tweeting: "No one person - no matter how corrupt, inept, or vicious - can threaten my unwavering love for America. "CAIR was founded after 9/11," she added, "because they recognised that some people did something and that all of us were starting to lose access to our civil liberties."